Rinjo, Chola Pass and Kalapattar trek is one of the most challenging routes in the Khumbu region. The trek continues from Namche Bazaar via Thame and then goes over Ranjo Pass to reach Gokyo and Gokyo Ri. From Gokyo you cross Nagozumda Glacier to Chola pass, And then we follow the way to Everest Base Camp, Kala Patthar to see the best view of Mt. Everest and return to Lobuje crossing the Phokolde Pass to the Chukung valley. Great panoramic mountain views including Everest, picturesque Sherpa settlements, Crossing through great Rengo La pass, Cho La pass, Gokyo peak & Gokyo lake View of Khumbu Glacier, friendly Sherpa people. Arrival and transfer to hotel, after some refreshment, welcome dinner. Day 03: Fly to Lukla and trek to Phakding (2,652m, 3/4hrs) o/n in lodge +O+L+D. This is the scheduled ‘acclimatization’ day for this trek. Health experts always recommend us to stay active and moving during the rest day too instead of being idle. We either spend the day taking a day hike to Thame or visiting Khunde or relaxing and exploring Namche Bazaar itself. Namche Bazzar is the main centre of the Everest (Khumbu) region and has government offices, ATMs, Internet cafes, shops, restaurants, a bakery and a colorful market each Friday evening and Saturday. If we trek a few hundred vertical feet during the day, it will help us to properly acclimatize. Our guides will take us to the Tourist Visitor Center near the headquarter of the Sagarmatha National Park where we can observe an assortment of things related to the first Everest ascenders, Sherpa culture and learn about the various plant and animal life of the Everest region. We also take an interesting side trip up to Khumjung. We climb up to the famous airstrip at Syangboche. Just above the airstrip is the Everest View Hotel, a Japanese scheme to build a deluxe hotel with great views of the highest mountains on Earth. The Khumjung valley is surrounded by the snowy peaks of Kongde and Thamserku and the sacred peak Khumbila, hosts a well known monastery that houses a yeti scalp. We also visit Hillary School which is at the same site. After having lunch and spending some time in Khumjung, we walk back down to Namche Bazza. The trail to Gorak Shep goes ahead through the lateral moraine of the Khumbu Glacier. We pass though the pyramid sign post. Ahead on the trail we see crest of north ridge of Everest along with Mt. Pumori, Mahalangur, Lingtern, Khumbutse, Nuptse, etc. A small ascent would take us to Thangma Riju. As we reach Gorak Shep, we will be surrounded by snow-capped mountains looming all around us including the top of the world – Mount Everest. After a brief lunch and rest, we take the trail to Everest Base Camp through the once vast Gorak Shep. Today is the climax of our trip. We start early in the morning to catch the dramatic views from Kala Patthar witnessing the first light of day shining on Mount Everest. However, we need to get prepared for an early morning; there is always the potential for chilly winds which are quite common. Familiar peaks such as Lingtren, Khumbutse, Changtse tower to the east even as Everest begins to reveal itself emerging between the west shoulder crest and Nuptse. During the ascent to Kala Patthar we can pause to catch our breath at several outstanding view points to snap pictures. After several hours of an ascent, we reach Kala Patthar. From here we scramble to climb the rocky outcrop near to the summit marked by cairns and prayer flags. As we reach the top, we sit on the Kala Patthar rocks our eyes taking in the unbelievable Himalayan Panorama, wandering from one mighty massif to another. We take as many pictures as we can with our camera and take the in view with our mind’s eye to last lifetime. On being back to Gorak Shep, we have breakfast and continue trek back to Dzongla. After early breakfast, our walk begins as we transverse through a spur extending westward from Dzongla. The path descends to a basin across which meanders a murmuring stream crusted with ice at places. In about an hour, we reach the top of the basin readying for the triumph on ChoLa pass 5430m. As we gain height, the view back gets increasingly more captivating; the Chola Lake begins to appear and the Ama Dablam in its pyramidal incarnation presides over a range of mountains on the south as Cholatse soars on the west. An early breakfast, start trek dawn today as we have to trace our trail up to Marlung today after conquest of Renjo La 5345m. As there is no alternative to Marlung for overnight, we need to start early. Down from the Gokyo Valley, we leave the main trail and turn to Renjo La trail by Dudh Pokhari. After about 3 hours, we gain the Renjo La where a dazzling vista awaits. The Everest itself, Lhotse, Cholatse and Taboche can be seen shining in the sun. Views from Renjo La are much like that from Gokyo Ri with third Gokyo Lake and Gokyo Village beneath the gray smear of Ngozumpa Glacier. The descent from Marulung to Thame follows a traditional route used for centuries by the Tibetan traders. 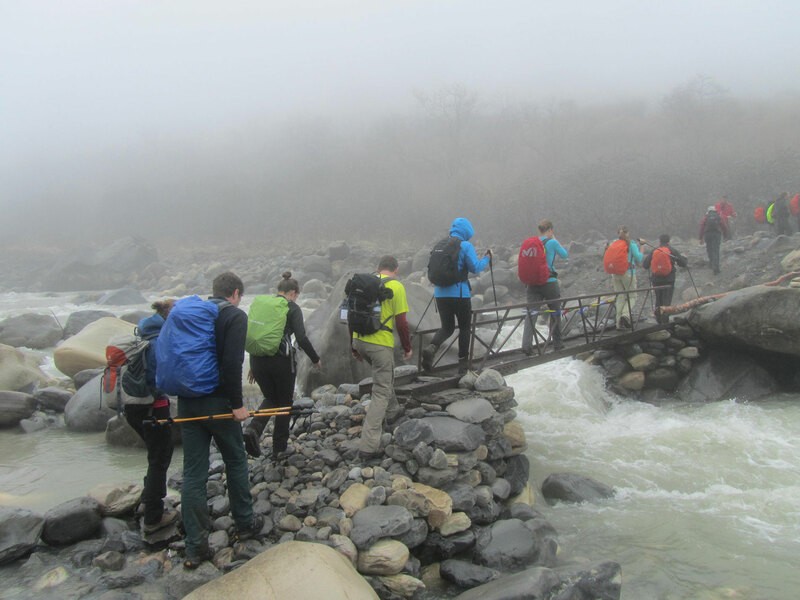 Down from the Marulung we cross the Bhote Kosi and descend to Taranga. The trail then goes through the valley of Langmuche Khola. This stream drains down from Dig Tsho, the glacial lake that burst its banks in 1985, causing devastating floods along the Dudh Kosi Valley to moraine to Thame. Thame has a sprawling village with a few lodges and stunning mountains like Thamserku, Katenga, Kusum Kangguru, etc. Overlooking Thame is its famous Gompa situated some the fields, on a hill to the west. Established some 325 years ago, the Gompa has three big images of Chenresig (Avalokiteswara), Guru Rimpoche, Buddha Sakyamuni. Colorful Mani Rimdu festival featuring colorful mask dances is held in this Gompa in May. We climb down after crossing a bridge after then eventually reach Samde and continue to Namche bazaar. After breakfast ,we start trek same route down, we feel completely different views, we snap a mixture of open plains, rhododendron and pine forests, and in the distance snow covered peaks. We walk through the Sherpa villages’ noticing impressive faith in Buddhism and culture of prayer stones and prayers flag while we walk through the villages. On arrival in Lukla, we stretch those sore legs and recall the experiences of the last couple of weeks. We experience the culmination of a fantastic trek on a happy note with everyone back safe and sound with smile on their faces.